“She’ll be Right Mate” – silver cuff ring workshop with jeweller Areta Wilkinson will take place on Saturday 8th June from 10am to 2pm. Cost $50 per person. 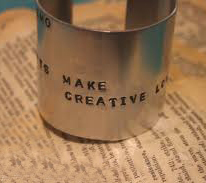 Make and wear your own sterling silver cuff ring. This original work will made by your own hand with it’s own unique kiwi flavour – belonging no where else but to Aotearoa / New Zealand. Our workshop will introduce the first steps of working with silver sheet including silver-smithing techniques of sawing, filing, sanding/finishing, stamping, patina, polishing and bending. Bring along a few lines from your favorite kiwi expression, poem or song to print onto your ring, pencil & paper, and close range glasses if you need them (I do!). Areta Wilkinson has been making and teaching jewellery making for 20 years.